Unpolished slabs of Rob’s mystery rock at the February workshop. Field of view about 8 inches across. It did not take me long to find this on the internet, a short note dated February, 2018 within a forum thread on the rocktumblinghobby.com webpage. Rob’s piece, and now slabs clearly came from the Utah location. My interest was piqued to learn more. 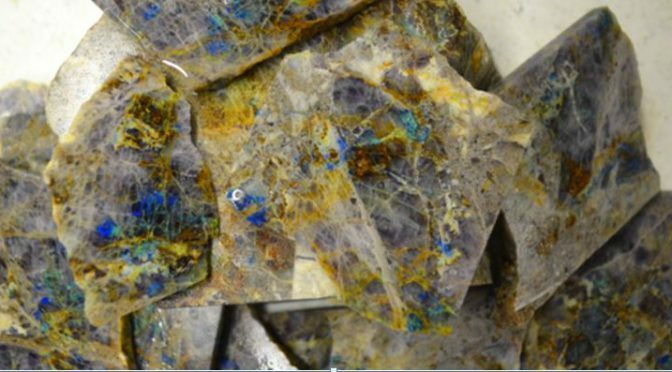 I quickly learned about kaleidoscope jasper from the volcanic flows in central Oregon as several rock club newsletters have run stories in the past decade. The story of its discovery is interesting and is best documented on a Facebook page authored by the man who found the material during the winter of 2007-2008. Dale Rhode and his family went about the process of staking claims and legally “mining” the material over the next several years. 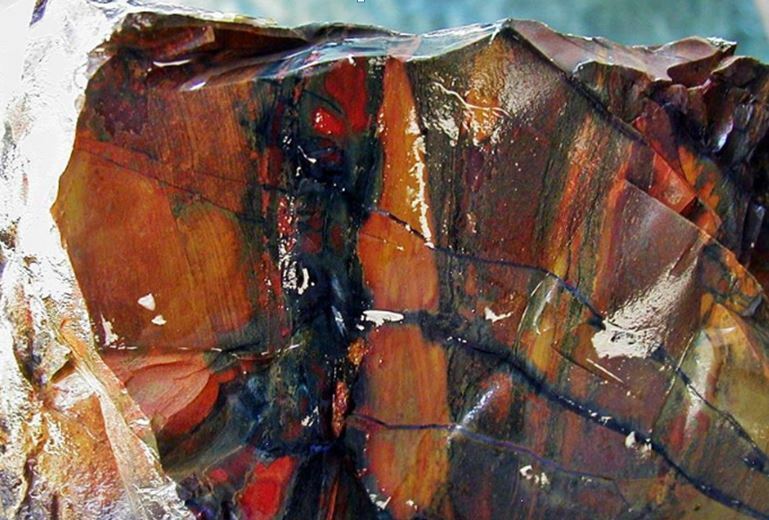 Because of the remarkable coloration and the variety of colors/patterns exhibited by the jasper they coined the name “kaleidoscope jasper”. As the material was collected they added additional descriptive terms like “tapestry”, “owl eye”, “picture”, “flame”, and others. The Austin, TX mineral club published a thorough review on the discovery and the many names in its August 2012 newsletter. True kaleidoscope jasper from central Oregon from the Kaleidoscope Jasper Mines FB page. But Rob’s piece(s) are not this jasper from Oregon. So I looked further. Unfortunately, I could not find details on the location or type of deposit of the Utah occurrence, but I did find folks discussing it. 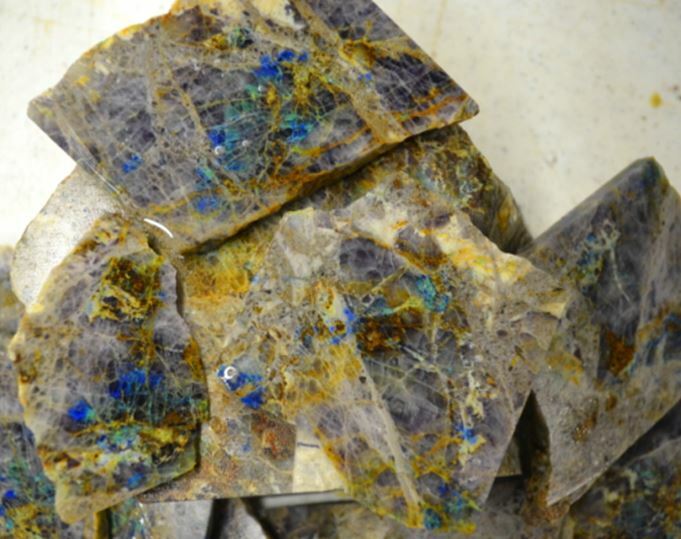 Those who recognized it to be some sort of hydrothermal vein deposit rather than jasper referred to it as “Kaleidoscope Stone”, or simply fluorite with associated copper minerals. 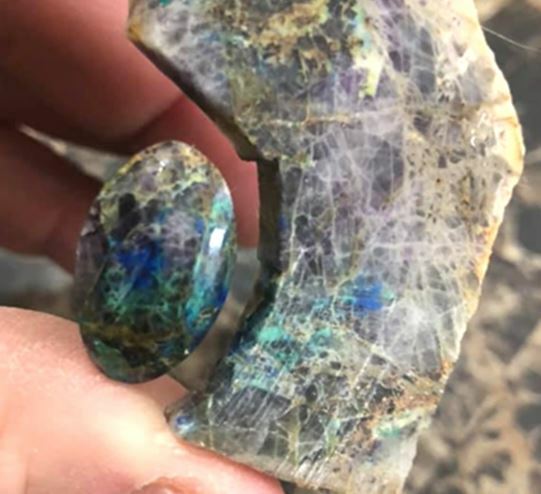 It is a very colorful stone dominated by purple fluorite, but with sufficient chrysocolla, malachite and azurite to be attractive both in raw specimens and in polished section. Rob proceeded to cut out a small piece and produce a polished cabochon. Because the primary mineral is fluorite it polishes easily. The added color from the dispersed copper minerals adds to its desirability as a lapidary stone. Some suggested that it tended to fracture during preparation, but Rob had little trouble with the slabs he has cut and polished. I guess this is just another example of the vagary of naming conventions used for lapidary material.